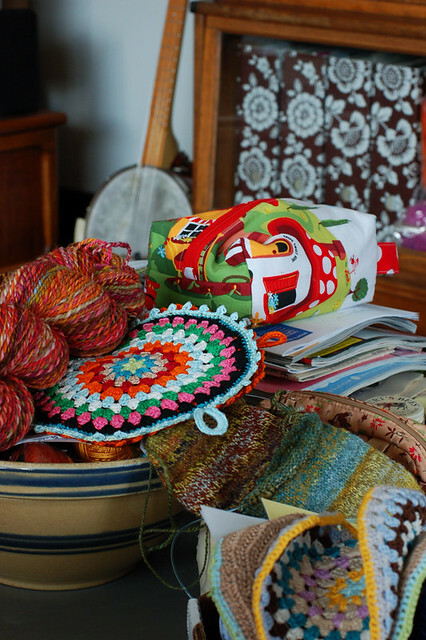 It’s time for the 3rd annual potholder swap! 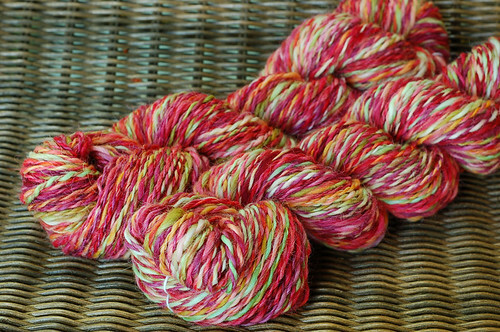 There’s a Ravelry group and a Flickr group if you missed the announcements and want to participate. After much thought, I decided not to reinvent the wheel, which I really feel the urge to do when it comes to this swap, and just make something that revs my engine. 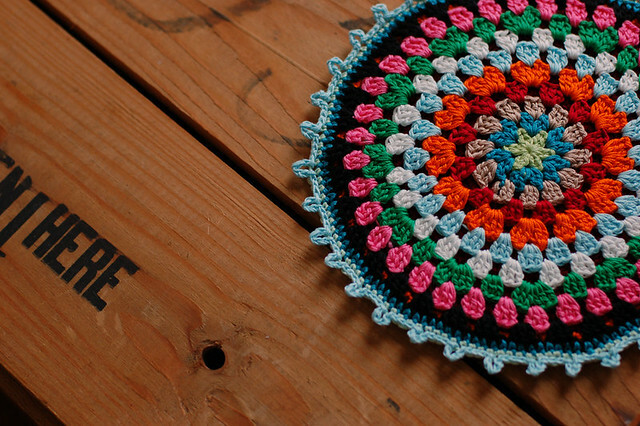 I love old-fashioned potholders and I love a million bright colors, and I LOVE LOVE LOVE little picots, so there you have it. Pattern: Granny Mandala (rav link). The back is a solid dc circle (I like and use Bea Aarebrot’s Potholder pattern). 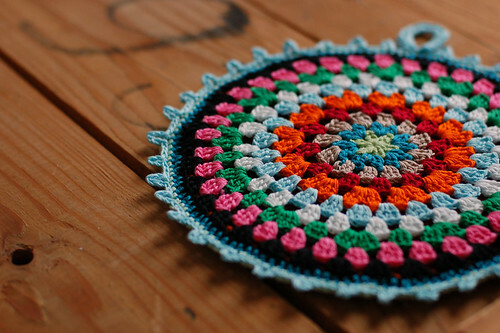 Confession: I can’t get the dc2tog in the Granny Mandala work for me. There are always 3 on the hook to pull the tread through at the end, not 2. It works and looks fine, so I guess it’s fine. Inspiration: I completely flipped out when I saw this pillow and started planning these potholders. This potholder put me over the edge. I wanted a slightly lighter fabric than I got with Tahki Cotton Classic, which I used for the past two swaps’ potholders. The plan was to use the yarn held single, but I am just not made of strong enough stuff for that, especially since I make potholders for the other organizers and helpers, bringing me up to 8 total. Size 3 thread would be perfect, if it came in decent colors, which it decidedly does not. It turns out the doubled size 10 is fantastic and doesn’t cause any problems while crocheting. This required rewinding all the yarn into center-pull balls, which might have put me off the idea if I hadn’t already gotten the yarn before realizing it! 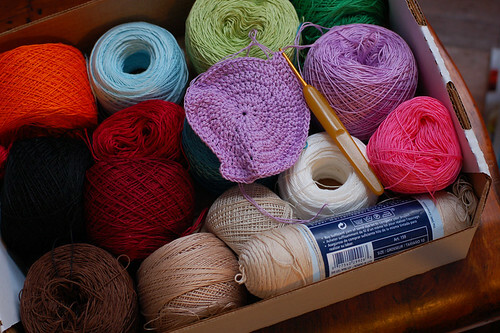 It’s so fun sitting with this box of colors in my lap, lining the colors up and making these simple potholders. * wool clothing- I’m obsessed with finding a nightshirt like the ones Hanna Andersson has, but wool. I think I’m going to have to sew the thing. There’s cool fabric to be had, though! * cowls- I dyed up some chunky wool in a pale, silvery blue for this cowl (the white one with popcorn stitch). Isn’t it so cozy and gorgeous? * bread- Cold weather gives me such an urge to bake. This scallion bread looks delicious. There’s a shop update tomorrow, 1 pm EST. All the items are already shown in the shop so you can see them now.